Fish Forward | Food and Drink | Style Weekly - Richmond, VA local news, arts, and events. Renowned chef Lee Gregory wants to raise conservation awareness at Alewife. Scott Elmquist Renowned chef Lee Gregory wants to raise conservation awareness by serving local fish like mackerel in his new restaurant. It's seafood, but not like you may have come to expect. "We're trying to figure out the best way to showcase parts of the Chesapeake Bay and Virginia," says renowned chef Lee Gregory, whose name you may recognize from the Roosevelt and Southbound. "Tonight we've got mackerel on the menu and you don't see a lot of that on menus around town. It's not rockfish." Fans of Gregory's have been anticipating the opening of his first solo venture, Alewife, since last November. The fish-focused restaurant quietly opened its doors two weeks ago, first with no liquor license and now with a full bar. Gregory admits there are still kinks to work out, and establishing Alewife's place and role in Richmond's food scene will be ongoing. The menu has already been through several iterations since opening day, and Gregory says to expect at least minor menu changes on a near daily basis. "We're trying to keep it fresh. Every day we'll have to order all the stuff and start from scratch," he says. "In doing that, we'll be able to evolve, use small farmers, buy on a day-to-day basis. I'm not sure much will stick around for a long time." A menu from last week featured starters like an olive oil pancake, which had already changed from both a cauliflower and corn variety, with tuna, tonnato and bonito and crab claws with roe mayo. Entrees included a roasted whole fish with enoki mushrooms, mustard greens, rice and green curry, a fried oyster po' boy and wagyu steak with potatoes and mushrooms. And for dessert? Soft-serve ice cream — that'll be available every day — a sundae with almond brittle and pineapple jam, and pavlova with chocolate meringue. At the bar, Gregory says the menu leans heavily on natural, biodynamic wine. But bar manager Katie Bess, who holds the same position at the Roosevelt, is also bringing creative cocktails into the mix. "It won't be as bourbon-heavy and classic-feeling as the Roosevelt," Gregory says. "This stuff will be a bit more refreshing, easier to pair with seafood." His new restaurant is not only an opportunity to flex creative muscles and serve delicious food — it's an effort to promote conservation and sustainability. His wife and in-laws are from the Tidewater area, which Gregory says has turned into a home away from home. 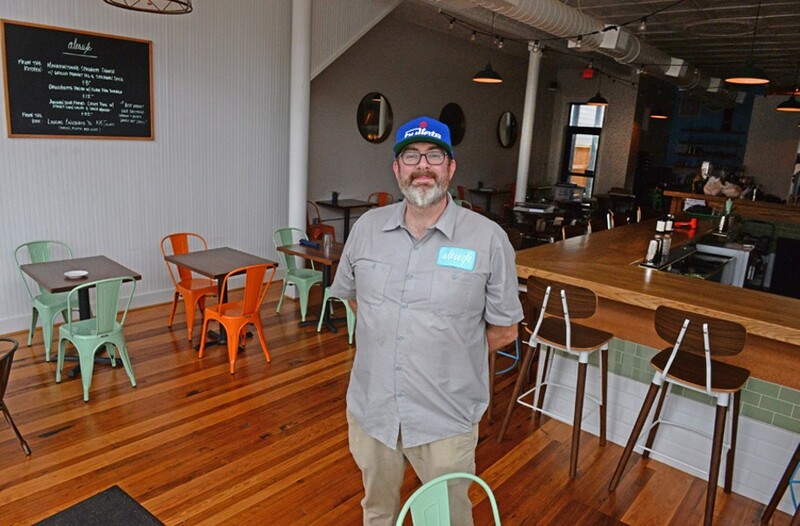 He wants to support organizations like the Chesapeake Bay Center, and hopes his approach and presentation at the restaurant will highlight environmental causes like water conservation and overfishing. "It's just kind of what you're supposed to do as chef," Gregory says. "Even, frankly, as a human." Tuesdays - Saturdays 5 - 10 p.m.